Breadvan. Say that word to most people and they’ll likely conjure an image of some boxy Grumman delivery truck parked outside a grocery store. Say it to a motoring enthusiast – especially one with a penchant for Italian racing history – and something completely different comes to mind. Naturally, we’re speaking of the legendary Ferrari 250 GT SWB competition model modified with a boxy backside to compete at LeMans in 1962. Now, a London-based company is preparing to build another one-off Breadvan as a tribute to the classic racer using a modern Ferrari. Sort-of, anyway. 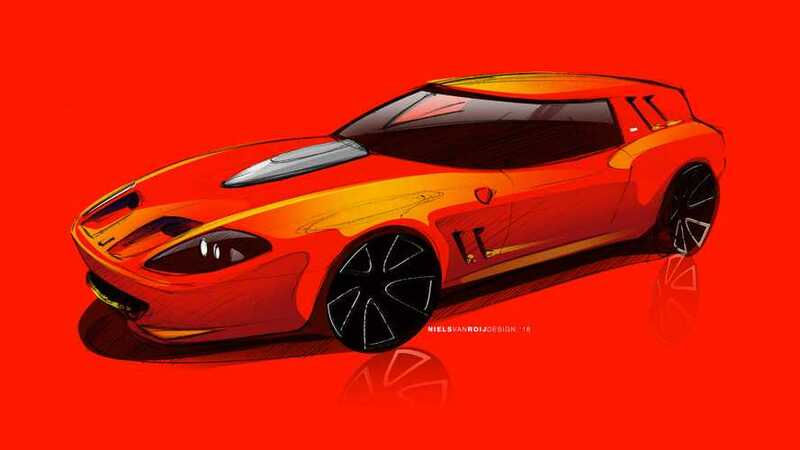 Niels van Roij Design is the company in question, and if the rendering above looks suspiciously like a Ferrari 550 Maranello, you’re not wrong. Niels van Roij – who’s both the chief designer and the person with his name literally on the company masthead – chose the 550 because of its spiritual connection to the original Ferrari 250 GT. That is, it’s a big front-engined, rear-wheel-drive V12 GT car, the first such vehicle to hold a place in Ferrari’s lineup after the legendary Daytona. Building a modern-day Breadvan will involve lots of fabrication. According to the press release, saws have already sliced up the 550 in preparation for the build. Not only that, Van Roij says every single panel on the car will be replaced, even the front where you wouldn’t expect to find much in the way of changes. Despite this thorough reworking, the goal of the project is to retain the “essence” of the 550 Maranello, albeit with a slab-sided rear end. As the photo gallery above shows, work is well underway. If we’re honest, the renderings look a bit awkward to us, especially with the “see-through power dome” on the hood. The renders actually show different designs, too, so it appears final details are still being sussed out. Niels van Roij Design promises weekly updates on the build through social media, with a target date of completion being the end of this summer. We’ll certainly be watching to see how this build progresses. The London-based design house Niels van Roij Design recently announced that it will make a contemporary interpretation of the legendary 'Ferrari Breadvan'. This unique hand-built car from the sixties, will now have a successor based on the Ferrari 550 Maranello. "The choice to go for this icon of the 90s was logical," says car designer Niels van Roij. "The 550 is the first Ferrari in 24 years (since the Daytona) which was built in the same way as the 250 GT at the time; a large V12 in front with a manual gearbox. It gives us a unique opportunity to base our interpretation of the legendary Breadvan on a car with a corresponding DNA." Meanwhile, the saw has gone through the donor car and the back of the 550 has been separated from the rest of the vehicle. Van Roij: "We want to preserve the gentleman racer look of the Maranello and also incorporate the strong graphic characteristics of the Breadvan into the design. Think of the air intakes, unmistakably integrated on the side and rear fenders and of course the iconic back featuring its strong rake. (Design language for the angle of inclination in which the rear is built) We are going to bring the exact angle of the original Breadvan back into our design. With our design ideas we have given our coachbuilding team a difficult task. It is an extremely complex job to shape the aluminum body by hand in these precisely defined lines." When asked whether we will recognize the 550 Maranello base car used for the Breadvan Hommage, Van Roij is clear. "Although we will change each and every body panel we will deliberately show the essence of the looks of this unmistakable '90s GT. However, we will work thoroughly: only the windshield remains original and even the headlights are changed." In the coming months Niels van Roij Design will reveal more about this project every Friday, during the Breadvan_updates on social media. This offers a unique look inside the world of car design and coachbuilding. From idea to design, from 550 Maranello to #BreadvanHommage. Followers will witness the design process develop, from a design on paper through a clay model in full size, to the final end result expected at the end of summer 2019.